Agora Lifting Eye Cream claims to be a restorative cream that refreshes and hydrates skin around the eyes; leaving it soft and supple with fewer fine lines as well as reduce puffiness and dark circles. The manufacturer claims that this product uses breakthrough technologies, but will the product efficacy as well as customer support be worth the investment? Read this review as we examine all aspects of this product in order to answer that question. The manufacturer claims that DermCom extract is a breakthrough biotechnology with “cell2cell communication” that was developed through extensive research to offer anti-aging and lifting benefits to the skin. This is combined with peptides and Hyaluronic Acid to increase the firmness of the skin as well as promote a youthful glow. The manufacturer doesn’t offer any other information on the ingredients, therefore, we are uncertain as to the concentration of the key active ingredients or if there are any other ingredients included in the formula. It is unfortunate to note that this formula is missing patented ingredients known to offer targeted relief of aging skin around the eyes such as puffiness-reducing Eyeliss – Sederma; wrinkle-eliminating SYN-EYE; or collagen-boosting Syn-Coll. In saying so, we are uncertain if this product’s formula will be as effective as competitor products that include these patented ingredients. Furthermore, there is no mention if this product is vegan-friendly, cruelty-free, or manufactured in a GMP certified facility. Therefore, the ethics and production quality of this product is in question. The manufacturer offers relatively vague instructions for use, simply stating that the product should be gently applied around the eyes and massaged in until the cream is fully absorbed. We are uncertain as to how much to use per application or how frequently the product should be applied. Direct contact with eyes should be avoided and those sensitive to the ingredients listed above should refrain from use. Most products give the concentration of the key active ingredients (for example, 10%) however, there is no information pertaining to the concentration of the active ingredients. Therefore, we are uncertain as to how effective this product actually is. 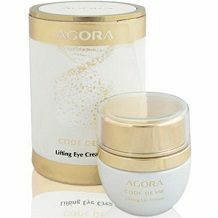 Agora Lifting Eye Cream can be bought online directly from the manufacturer’s website. Each unit retails for a staggering $595.00, which is incredibly expensive – especially considering the volume of product is not provided. With no discounts or package deals available, this product may be too costly to sustain. There is a 14-day period in which the customer may qualify for a refund for products purchased from the Agora website. The customer will need to email the company as well as send back the product in its original packaging and proof of purchase. There is no mention if this policy is extended to tested products, which is a concern. Furthermore, there are absent customer reviews for this product to confirm claims of efficacy, which is concerning as the exorbitant price does not seem justified with no customer testimonial. Agora Lifting Eye Cream claims to have highly effective ingredients that, in theory, support the manufacturer’s claims of producing youthful and hydrated skin. One ingredient, in particular, is also award-winning, which is positive to note. However, the absence of the concentrations of the key ingredients, the lack of patented ingredients, as well as no GMP certification is a concern. The customer service offered by the guarantee is also limited and vague, with too few customer reviews to support claims of efficacy. In saying so, we feel that the price of this product is not worth the investment and therefore do not recommend this product.